Game Emergance | It's time to go to MARS and do so as FRIENDS! Dominion is awesome deck building game that is always different. With 2 standalone sets and 5+ expansions, the game is ever-changing. The best part of Dominion is that you randomly choose 10 decks (sometimes more depending on cards chosen) from any of the sets, which ensures that every game is slightly different. While playing with my friends for months, we decided to take this game to the next level. We incorporated the team element to to what is usually a single player game. This new paradigm required new strategy and team work. Let’s lay out the added rules and how scoring works. 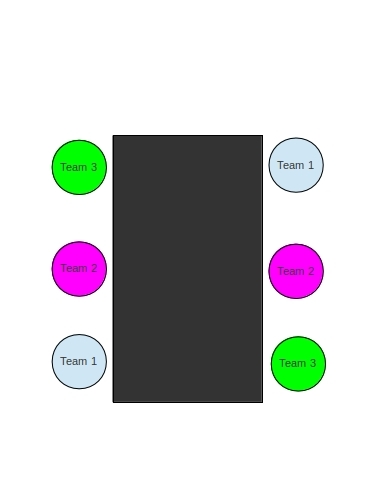 Players on a team exchange 1 card, without looking, before the beginning of the Action phase of a member on the team. This is where the strategy comes in. The simple way would be to add the Victory points of all the members of a team and the highest team total would win. However, we decided to complicated things a little more. This is a fun variation, that adds a little bit of team play to this great strategy game. Zombie Dice is an awesome game by Steve Jackson Games that my friends and I have enjoyed playing. This is a great game that combines Zombies, Brains, and Gambling. The basic premise is to collect Brains and avoiding getting shot by your dinner. A turn starts with grabbing 3 random dice (potential dinner) out of 13 (6 Green, 4 Yellow and 3 Red) out of a cup. On each dice has 3 symbols: Shot, Brain and Footprints (runners). Gambling comes into play, since each color has different proportions of these symbols.